The Susquehanna River has always been in my periphery, flickering sunlight catching my eye and osprey hovering off in the distance at the edges of my life. I’ve moved back to the area and the river is finally coming into focus. I tell people I’m from Lancaster, yet the Susquehanna River marks my place more than a name on a map or address typed into a GPS. My first taste of freedom as a teenager came when the river level got low enough so my best friend Steve and I could walk out to the rocks below Conewago Falls and fish for catfish deep into the night. I know it’s time to start chasing bass once the cicadas begin playing the rhythm of the summer, slowing down the water enough so rocks hidden for the last nine months start peeking out of the surface. There’s enough access along the river in its lower watershed there’s no need to travel far to find fish; you don’t even need a boat. In August, you can wade out far enough that your two feet are as effective as a motor. My bass fishing rig consists of a mountain bike to traverse the rail trails, two fly boxes, awading boots and socks, and a 7/8-weight fly rod. I keep things simple and light, which gives me the chance to do a lot of exploring up, down and into the river. The Susquehanna once had a world-class bass population, which gave the river notoriety back in the ‘90s. Then, in 2005, the bass population took a drastic dive. There were years when anglers would hardly catch any and those landed had lesions and sores. Some say the decline in population was due to the increase of pollution in the river, while others contend that it was an unfortunate mixture of low water and high temperatures. Either way, the fishery languished for a number of years. Recently, however, more and more healthy bass seem to be showing up and surviving. 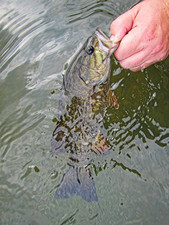 New surveys by the PA Fish & Boat Commission show signs of an improving number of young bass alongside a declining number with lesions and sores in the Lower Susquehanna--a good sign for the fishery and for the river since a healthy bass population also means a healthy river. 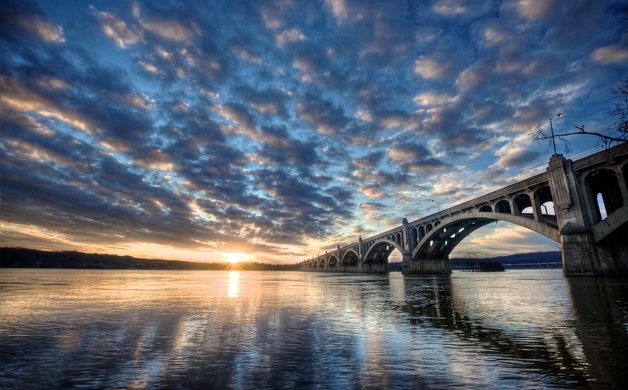 The goal of the commission’s “Save Our Susquehanna” campaign is to bring awareness of the river’s health and potential. 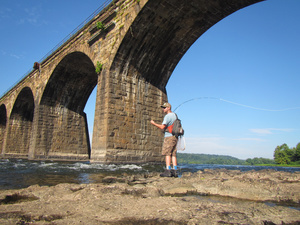 I came back to the Susquehanna by way of its springs and tributaries, searching for wild trout as I learned to fly fish. These veins of water empty into the main artery as the river forks its way through New York and Pennsylvania, eventually joining into the main stem at Sunbury. Eel and shad were the prominent denizens of the river and, along with oysters and crayfish, fed the early inhabitants. The shad would spend most of their lives in the Atlantic Ocean, bulk up on salt water life and spawn up the Susquehanna. They were plentiful, big and didn’t even need butter to taste good. Nowadays, when they try to swim upriver to spawn, they hit a wall. Only some make it through the fish-ways at the hydroelectric dams. To make up for the loss, shad have been stocked throughout sections of the Susquehanna between each set of dams: Conowingo, Holtwood, Safe Harbor, and York Haven. As with most waterways, we are able to trace the history of the resilient banks that line them to emerge with a story of place. In the past, raft men and canal operators would pass by the Billmeyer Limestone Quarry, Musselmen/Vesta Pig Iron Furnace and the Henry Clay Furnace as they worked up and down the river. Today, people walking their dogs and riding their bikes are met with stone ruins settled into groves of catalpa trees and slag heaps turned into white cliffs offering good views of the river. Where there was once the dark smoke of anthracite coal burning in the hot blasts for smelting dotting the banks like funeral pyres, we now have Bald Eagle nests and visitors centers. This river has gone from a place of sustenance for the Susquehannocks to an important cog of the industrial 19th and 20th century to the recreational waterway for boaters, kayakers and fisherman. For most, this river has always been in the periphery, but at certain moments in this area’s history, it was the place that defined the area. It created economies and towns. We are left with one of the oldest rivers in the nation that has lasted longer than anything else built along its banks. It still flows; it still marks this area—more than we acknowledge. There’s a spot I like that offers a wide, walkable section of the river. Not many know about it; there’s no sign delineating it. It’s not easily accessible by boat, due to the sets of rapids on both the upstream and downstream sides. There you can see everything the river has to offer: egrets, bald eagles, herons, the green plumes of underwater grass beds dotting the slow riffles hundreds of yards out, stubborn islands with maples and sycamores, hibiscus blooming, solitude, white flies littering the moonlit water and plenty of smallmouth bass. The long shelf of limestone and dolomite is perfect for drifting crayfish patterns, stripping Clouser Minnows and the short bursts of poppers. Typically, I like to keep spots like this to myself. Instead, I’ve been showing this place to my closest angler friends, eager for them to see what the river has to offer. While recently introducing this spot to a Lancaster County transplant who had never set foot in the river, he was astounded at the diverse life in and around the water. His first impression of the river wasn’t that it was sick and beyond repair, but a beautiful and great resource. I’m finally seeing this place from the river’s perspective. Wading out into the water, everything slows down. Now in our thirties, Steve and I have come back to this river focused on catching bass. We meander our way downstream to the next set of rapids. Steve’s catching them on something flashy, while I’m landing them on a crayfish pattern. 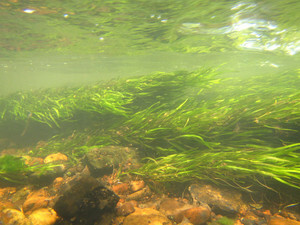 Like a magnet that we’re hopelessly, thankfully drawn toward, the river beckons us to chase the next ferocious take from a smallmouth bass, anxiously stripping our lines in hopes of getting a glimpse of the prehistoric stripes along their bronze backs, pausing only to watch a pair of Bald Eagles circle over an island or an egret stalk its prey in the shallows. No longer in the periphery, but now the focal point, the river draws us back, chasing those dark flashes in hot, humid late summer evenings as cicadas and crickets fill the air with their creaky orchestral wings. Michael Garrigan is a writer, fly fisherman and high school English teacher living in Marietta.